Usually from light gray, almost white, to dark gray. Many small blue and yellow lines on head. White Grunt feed on a diet of crab, shrimp, and mollusks. All Florida coasts and the Bahamas. Not choosy; inshore to deep sea, quite a versatile fish. 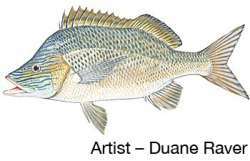 Averages 8-10 inches; not too uncommon at 12 inches or slightly larger, especially in deeper waters of the Gulf of Mexico.